Born in the rural countryside near Santo Domingo in the Dominican Republic, Joan Soriano fashioned his first guitar from a tin can and fishing line and has never looked back. Soriano plays steel string bachata with equal parts romance and grit. The Afro-infused rhythm that permeates his music has made him a favorite among dancers. As a boy Joan received little formal education. The seventh of 15 children, Joan left school to help his father farm the family’s land. But Joan’s destiny was for something else. Forming a band with his young brothers and sisters, he began to perform at neighborhood events. Nicknamed “Los Candes” (after their father Candelario) the band became a local sensation. At age 13 Joan hitched a ride to Santo Domingo and went on to nurture his talent working with some of the island’s greatest bachata stars. Bachata is essential to Dominican culture and draws upon a variety of influences from Africa, Europe, Latin America and the Caribbean. 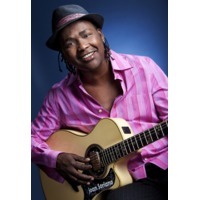 A practitioner of palo and gaga, Joan blends Afro-Dominican sacred traditions with bachata, imparting his music with down to earth spirit and dance-ability. Joan preserves bachata’s roots and expands on them. He is a rare combination of new and authentic.